There have been a lot of interesting personal injury and wrongful death verdicts and settlements in 2015 in Pennsylvania. Here are five verdicts you will find of particular interest. $450,000 Verdict – A woman is descending the stairs at her row home when she slips on one of the middle steps. She reaches for the hand rail, but just misses it, causing her to fall down the remaining stairs. The woman calls an ambulance, which transports her to the emergency room. At the ER, she is diagnosed with a fractured shin bone and a tear of the quadriceps. She has to receive care after the fall given that her leg is immobilized. After the accident, she sues the property-owner, alleging negligent maintenance of the stairs. In her lawsuit, she brings up the fact that she had told the property-manager about how slippery the stairs were on two occasions. At trial, her stair-expert suggests that the stairs were covered with too much polyurethane. This convinces the jury, who awards her $450,000. Doctors won 77% of the medical malpractice cases that went to a jury trial. In fact, there is not a single jurisdiction in Pennsylvania where the plaintiff had a winning record in 2013. 1,546 health care negligence lawsuits were filed in Pennsylvania in 2013. In 2012, the number was 1,510. Putting this in context, this is down 43% from 2000-02. Philadelphia, long considered to be the plaintiffs’ home field in Pennsylvania, filings are down 68% from 2000-02. The jury is out, literally, in a U.S. District Court case against the City of Pittsburgh. The jury’s decision – whether or not to hold the city at fault when the, now terminated, detective choked a man in a May 2010 road rage incident. After a fender bender, the detective grabbed the plaintiff by the throat, then chased him down waving his gun around after he fled. Crazy, right? The plaintiff claims that the city showed “deliberate indifference” to the detective’s past behavior, and they should have done more to curb a man who showed a “pattern of choking, pattern of off-duty rage, pattern of road rage.” The sides stipulated to 32 citizen complaints against the detective over a 17 year career that ended with his firing and subsequent criminal conviction on three misdemeanors following the incident. 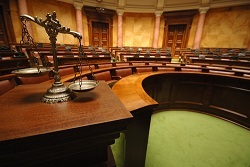 Juries are regularly asked to evaluate injuries and compensate plaintiffs. People may like to speculate what an injury would be worth to them but, like all things in life, financial sums are relative. Juror “A” may believe an injury is worth $50,000 in damages where Juror “B” believes that same injury is worth $500,000. It’s the court’s job to find a fair middle ground that compensates the plaintiff while not excessively punishing the defendant. Jury awards sometimes make headlines when they are so high that the sheer number of zeros gives us pause. Last week the Superior Court of Pennsylvania affirmed a jury award of $443,418.09 in the case of Renna v. Schadt. This was a medical misdiagnosis case where the plaintiff argued that the defendant doctor’s error delayed the detection of and treatment for her breast cancer. 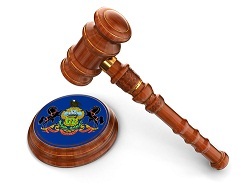 The defendant appealed on a few grounds including what he believed was an excessive jury award. Quick facts: Plaintiff was a 46-year-old special education teacher under the care of defendant physician. Plaintiff alleged that in May 2004 the defendant deviated from the standard of care when he performed a fine-needle aspiration biopsy instead of a computed tomography (“CT”) guided core biopsy on two lesions in her right breast. Plaintiff argued that the CT biopsy was a more advanced diagnostic technique and that had the defendant performed that biopsy, she would not have suffered an eleven-month delay in being diagnosed with breast cancer. Plaintiff underwent a bilateral mastectomy that was followed by eight rounds of chemotherapy and sixty-five radiation treatments to the right chest wall. She believed that this treatment was more aggressive and extensive than would have been necessary had she been diagnosed earlier. Additionally, the late diagnosis coupled with the bilateral mastectomy reduced the likelihood of a successful reconstructive surgery. Alleged in a lawsuit filed this week in federal court in Philadelphia, St. Louis-based Anheuser-Busch Cos. routinely adds extra water to its finished products to produce malt beverages with significantly less alcohol content than displayed on its labels. Similar lawsuits were filed in federal courts in New Jersey and San Francisco as well. According to the Complaint, Anheuser-Busch is violating state statutes on consumer protection by overcharging their customers for watered-down beer, and they are unjustly enriched by the additional volume that they can sell. The complaints accuse the AB InBev unit of also mislabeling the amount of alcohol in Bud Ice, Bud Light Platinum, Michelob, King Cobra, Busch Ice, Black Crown, Bud Light Lime, Hurricane High Gravity Lager, Natural Ice and Michelob Ultra. The Third Circuit issued an opinion in Jewel v. Ridley Township involving an issue that I find interesting: to what extent do police have an obligation to show restraint in a police chase? In Jewel, police heard an eighteen-year-old boy was drunk. Based upon previous arrests, the police knew the boy did not have a driver’s license. They found the boy and chased him with lights and sirens, all parties ignoring stop signs and red lights like they do on television. The boy, who was drunk, collided with a car and as a result, he became paralyzed. No matter how you slice it, this is a tragedy. The trial court granted the town and the police officers’ motion for summary judgment, finding that the pursuit policy was not constitutionally inadequate. This was a no brainer, right? The court also found that the police did not chase plaintiff with “deliberate indifference” through its allegedly inadequate training and supervision. This too seems like a silly claim. This was more likely than Eli Manning coming through in the clutch: insurance companies running for the hills in the Penn State lawsuit flood that has already started. Pennsylvania Manufacturers’ Association Insurance (PMA) has filed a declaratory judgment lawsuit disclaiming coverage in allegations that Gerald Sandusky sexually molested children. Penn State claims coverage. In the 16-page complaint, PMA argues that only the 1991 or 1992 policy is triggered, but, if it is the latter policy, coverage is precluded under that policy’s abuse or molestation exclusion. I think there are two levels on the insurance coverage question in the Penn State lawsuits. First, was this a coverage act or did the policy exclude intentional torts of employees or agents. Health Officials are reporting that the number of illnesses caused from individuals having consumed raw milk has risen to 35 people over four states. The confirmed cases of Campylobacter infection include 28 people in Pennsylvania, four in Maryland, two in West Virginia and one in New Jersey. The tainted milk appears to have come from the Family Cow farm in Chambersburg, Pennsylvania, and health officials have said that consumers should discard raw milk bought from the Family Cow farm on or after Jan. 1. The farm has voluntarily suspended raw milk production. The federal Food and Drug Administration warns that raw, or unpasteurized, milk can contain harmful bacteria, and Maryland law prohibits its sale. Still, dairy farmers have said that the demand is growing because of concerns about hormones in traditional dairy products.